The Marine Industry is continually introducing heavier outboard engines, higher horse power engines, more aggressive propellers, bigger/faster boats. Boat operators are asking for increased comfort and lighter steering loads. These were the driving forces behind the design of SeaStar and SeaStar PRO Power Assist. • Heavy 4 stroke outboards. • Inboards where rudder torque makes wheel effort heavy or uncomfortable. • Dramatically increases steering comfort. • Simple ‘add-on’ to existing SeaStar manual system (up to 2.0cu. in. helms). • Number of turns lock to lock remains the same. • Compatible with SeaStar Power Purge system. • Auto recognize system voltage (12V or 24V). • Capable of floor or wall mount. No need to purchase extra kits. SeaStar P/A (Power Assist) steering uses an electronically controlled hydraulic pump to provide “Power” for your SeaStar Hydraulic Steering system. 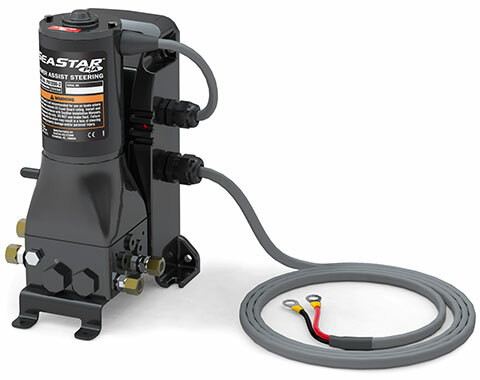 The SeaStar P/A system is comprised of two circuits: a hand operated manual system, which is the control element, and a hydraulic power pump, which is the working element. The manual system consists of a helm pump with internal relief and check valves, as well as a built in reservoir. Two steering lines and a compensating line which provide a routing for fluid to transmit through the system, and a steering cylinder which moves the steering device on the boat from side to side. The power system, is an electronically controlled hydraulic pump that boosts the fluid being sent from the helm pump to the steering cylinder (this will result in much easier effort at the wheel—even when under heavy loads). A compensating line connects the P/A unit to the helm pump, allowing the P/A unit to share fluid with the helm reservoir. The SeaStar P/A is compatible with multiple steering stations, and with the use of an autopilot. In the event of a P/A power loss or failure the hydraulic system will automatically revert to a manual hydraulic system. The Dual Ignition Control Kit is designed to connect the P/A unit’s ignition wire to two engines allowing one engine to be turned off and retain power assist control.